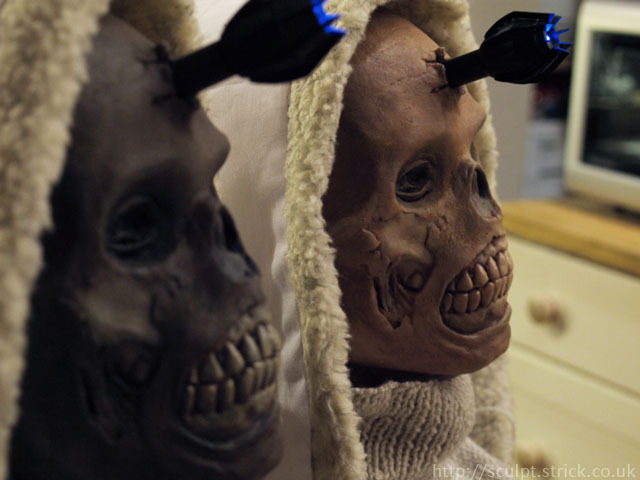 Replica masks of the zombie crew of 'The Alaska' seen in the Doctor Who episode 'Asylum of the Daleks'. 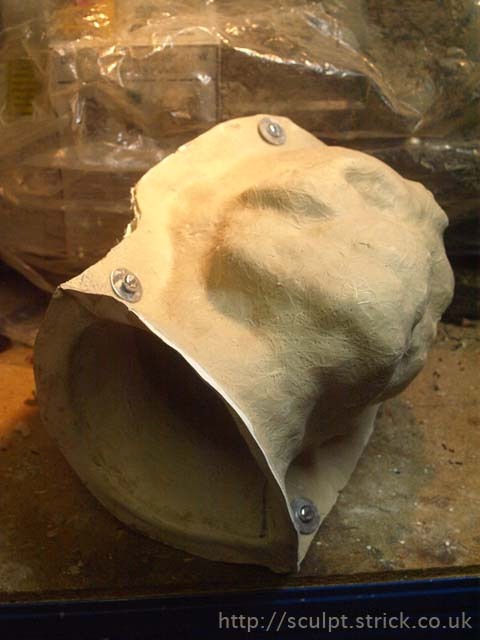 Since I needed a 'one size fits all' mask, I started with a generic foam head rather than a lifecast and built up a fairly thick layer of clay to allow room for differing head shapes and sizes. 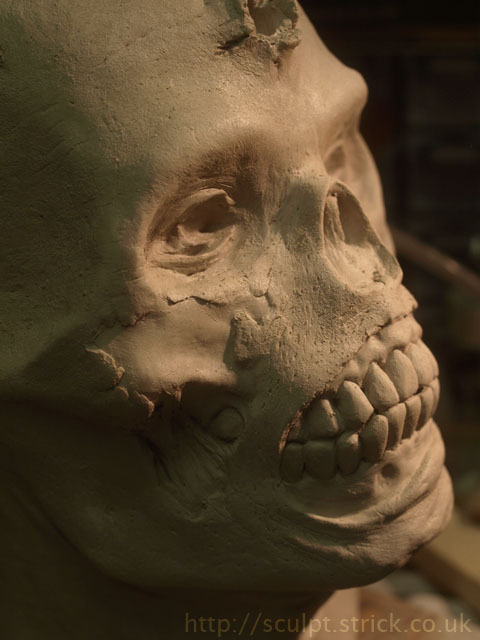 Working in WED clay, I sculpted the head to match the clearest screen captures I could manage. Unfortunately they don't have very much screen time and are mostly fairily heavily in shadow. I used reference shots of real mummified bodies to fill in details That weren't visible in the screenshots, as it's highly likely that the FX artists for the show would have used similar photos. 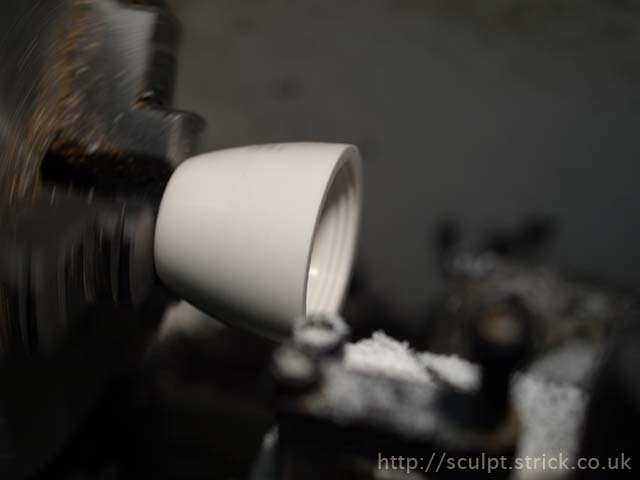 I tried to exaggerate the texture as I knew some of the sharpness would be lost during the casting process. 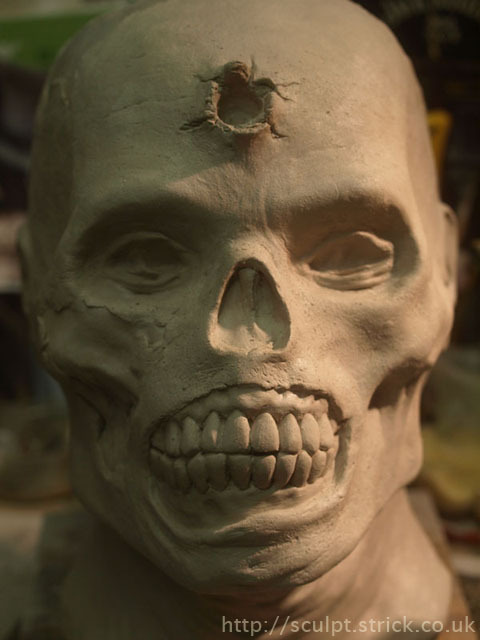 One of the problems with sculpting a skull over a human face is that deep hole of the nasal cavity of course lines up with the tip of the nose. 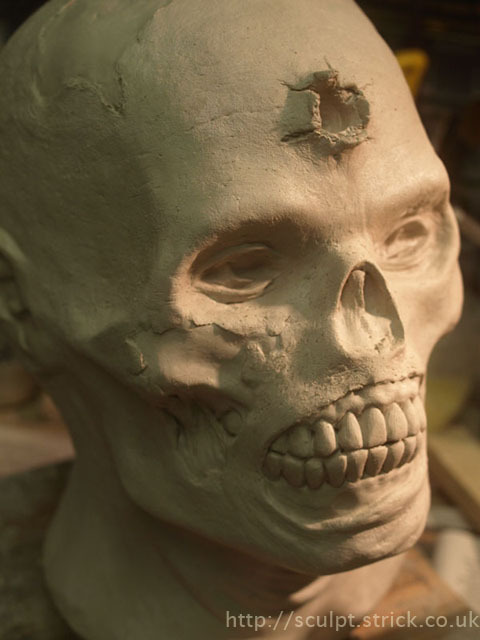 By sculpting the skull slightly tipped back, the tip of the nose is moved into the region of the nasal spine, and the nasal cavity can be sculpted just above it. 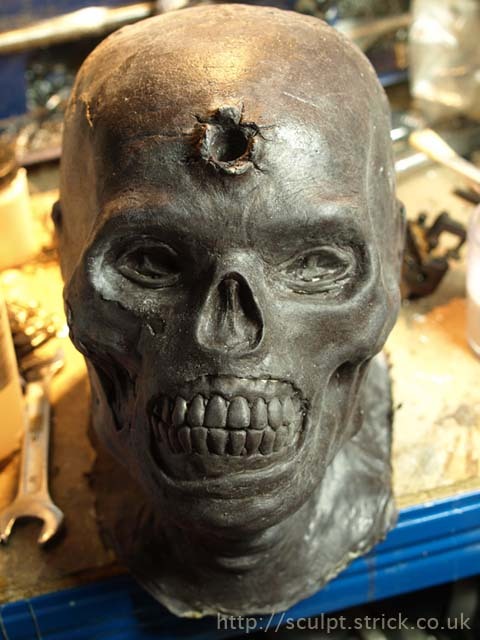 This also means that the eye holes can be hidden slightly lower on the face, making them harder to detect. WED clay starts out quite soft and slightly sticky and firms up as it begins to dry out. The firmer consistency responds well to tools and is good for detailing and texturing but quite unforgiving of tool-slips. It's important not to let it dry too much or it will begin to crack. To avoid mold from forming on the clay, I mixed a small amount of bathroom cleaner into the water I used on the clay. 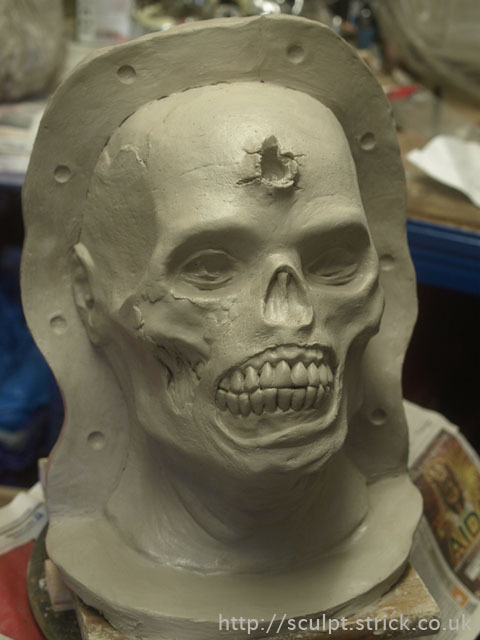 When leaving the sculpt overnight, I misted it with water, draped damp cloths over it and wrapped it in bin liners. Once I was satisfied with the sculpt I allowed it to dry out a little more by leaving it for 24 hours very loosely wrapped in a bin liner. The next day, the surface was sealed with four coats of acrylic lacquer. Once the lacquer had dried, I drew a contour line along the highest relief points of the sculpt with a permanent marker, defining the separation line between the two halves of the mould. Being careful not to damage the surface, I then built a clay dividing wall following my marker line. Several circular dents were pushed into the clay wall to act as keys that would later help locate the two halves of the mould. The whole front and wall was sealed with more coats of acrylic and then given three coats of mould release. The entire front was carefully painted with two coats of gelcoat. 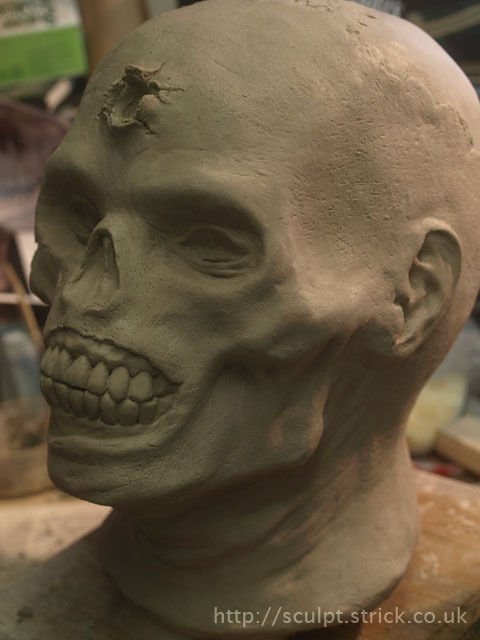 This is a key moment in any project since as soon as you start applying the mould material, there is very little chance of any of your original sculpt surviving; you are completely relying on the quality of the mould to preserve your work. The second gelcoat layer was added, building up the thickness in places to try and make the surface a little more regular as that would make laminating it easier. As soon as the second gelcoat layer became firm, I started applying fibreglass. For the first time, I tried a product called Easylam, which turned out to be extremely effective. It is a resin that contains some kind of suspension that both helps it soak more cleanly into the fibres and gives a smoother finish. I applied two coats. Once the front half was set, I stripped off the clay wall. I added several wedge-shaped blocks of clay to the flat fibreglass wall. These would later give me useful entry points to insert prying tools to ease the two halves of the mould apart. I then sealed the rear half with acrylic and applied several coats of mould release. I also applied several coats of wax release to the fibreglass. I then built the rear half using two coats of gelcoat and two coats of fibreglass laminate. Once it had hardened, I drilled holes through the walls for M6 nuts and bolts which would later be used to fix the halves together. I left the mould overnight to ensure it was fully cured before starting on the nerve-shredding task of separating the two halves. Before starting, I trimmed all the excess fibreglass from the outer edges using a Dremel cutting disk. I began the separation by carefully inserting a large screwdriver into one of my clay wedges and gently prying. I inserted a popsicle stick into the narrow crack that appeared along the separation line near the wedge to stop it from closing up, before carefully increasing the pressure and adding another stick as the crack extended. Next, I gently tapped the popsicle sticks with a rubber mallet, further extending the crack and added more sticks as I went. I repeated this process with the other wedges. Eventually the crack extended the whole way round the mould. I was now able to start prying harder at the wedge points until finally one half of the mould came loose. To my surprise, the front half came free first, despite having more undercuts. 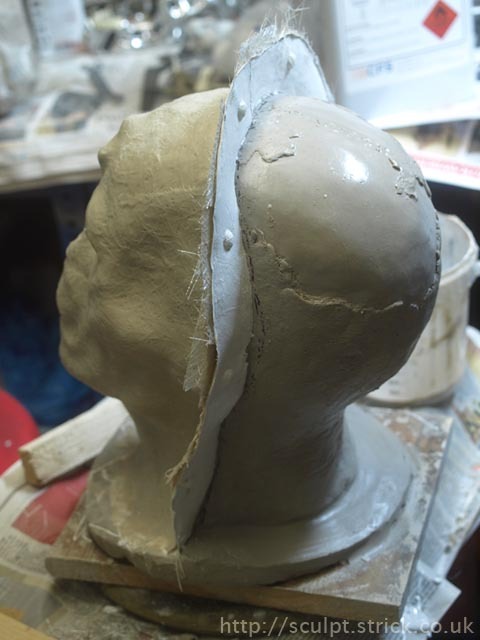 I found that rather than the fibreglass separating from the clay, the clay face had pulled clear of the foam head. This meant that I had the long and unpleasant task after cleaning the clay out of the mould with fingernails and a hose. It's possible that given time, drying the clay out would allow it to come free more easily. I may try this next time. I bolted the two halves together and left them to dry out fully ready for casting them in rubber. I applied mould release inside both halves of the mould. 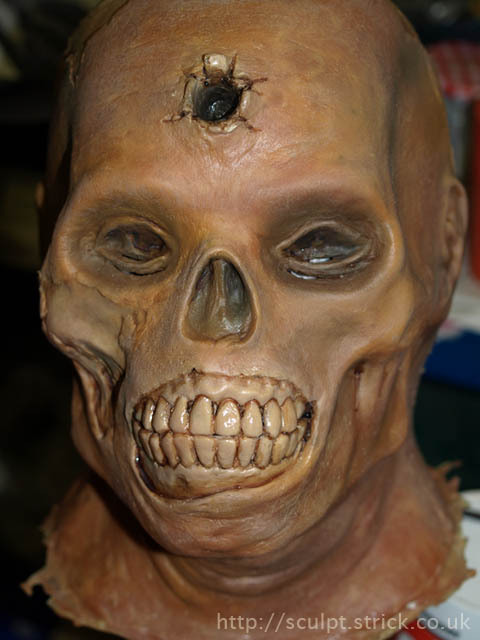 I painted pigmented liquid latex into each half and allowed it to air dry. I repeated this with four coats of latex, painting right up to the edges of each half but being careful to get none on the edge where the two halves meet. It is important to allow the first layers to dry naturally as heat can make them shrink away from the surface of the mould. Next I applied two layers using liquid latex laminated with toilet paper. I have not seen this latex papier mache technique documented anywhere else but have found that it reinforces the rubber and makes it more rigid. I now bolted the two halves back together and applied several coats of pigmented latex all round the join, before applying a couple of laminated coats to bond the two halves of the mask together. I was now able to apply three coats of thickened latex. 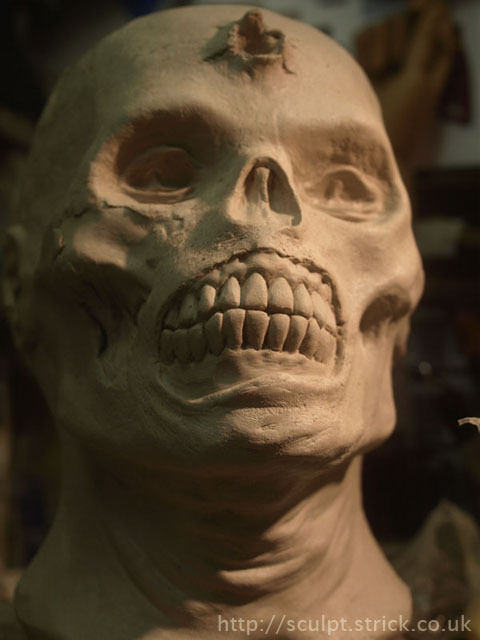 While it might seem quicker to apply thickened latex from the start, it will tend to flow into deep parts of the mould, forming thick areas that will not cure properly. 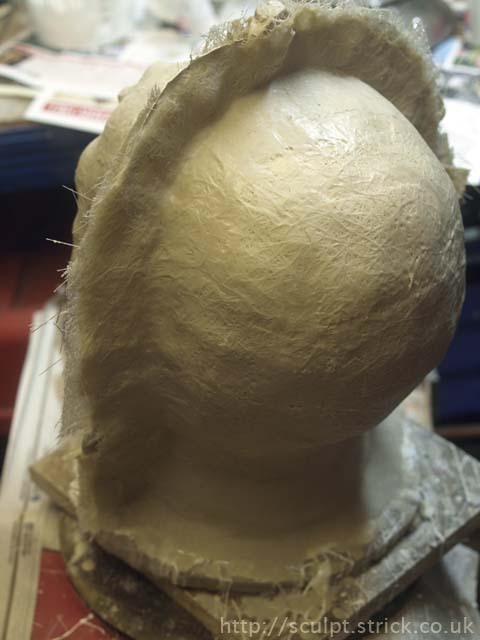 By this stage, the deepest recesses in the mould have been filled and the thickened latex will form a more consistent layer. It is also safe to apply a little heat from a radiator to speed the curing. 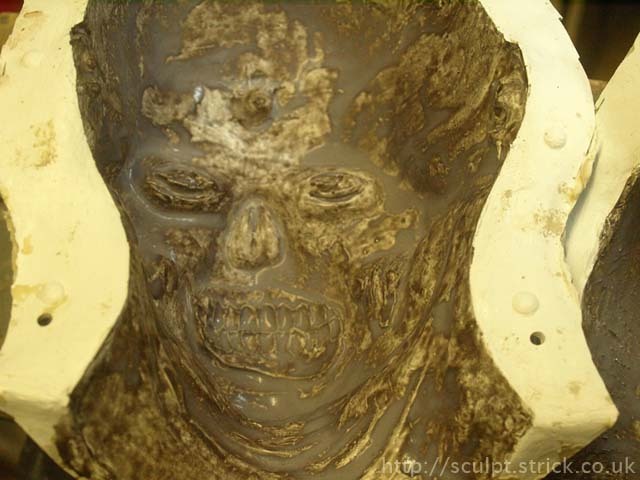 With the latex applied and dried, the mask was ready to remove from the mould. I started peeling the edges away around the neck and gently eased the back free, blowing in some talc to avoid the rubber sticking to itself. I then unbolted the two halves of the mould and carefully worked the front free. 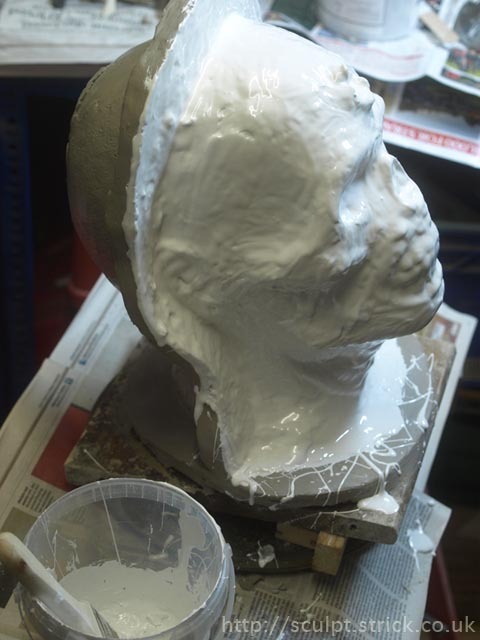 With the mask safely released, I applied release agent to the mould and started applying latex for the second one. I cut as many ventilation holes as I could hide in the deepest points of the mask, as well as holes near the ears (experience has shown me that it can be very difficult to hear in a full head mask). I cut a slit up the back of each mask, knowing that the hood would conceal the opening. I cut several small holes within the detail of the lower eyelids. These allowed a surprisingly good range of vision while still being hard to spot from the outside. I had decided that I wanted the two masks to look as different as possible despite coming from the same mould, so I had used a dark latex pigment for one and a lighter tint for the other. My plan was to apply highlights to the dark one and darker washes to the light one, hopefully ending up with very different feels to the two paintjobs. 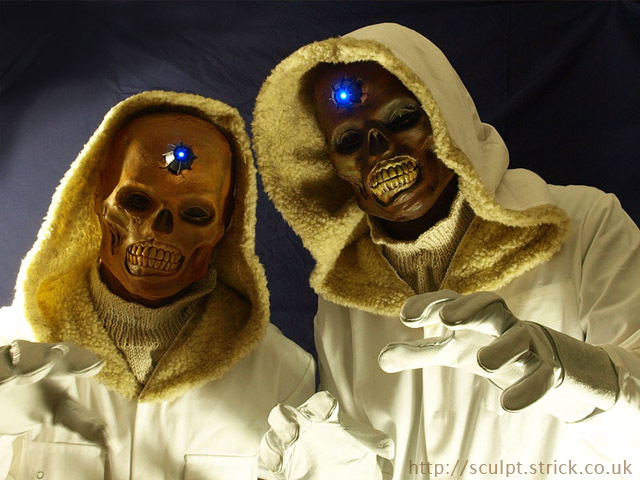 The masks were painted with pax paints using an airbrush and stippling with a fine brush. Ink washes were also applied to pick out the details. 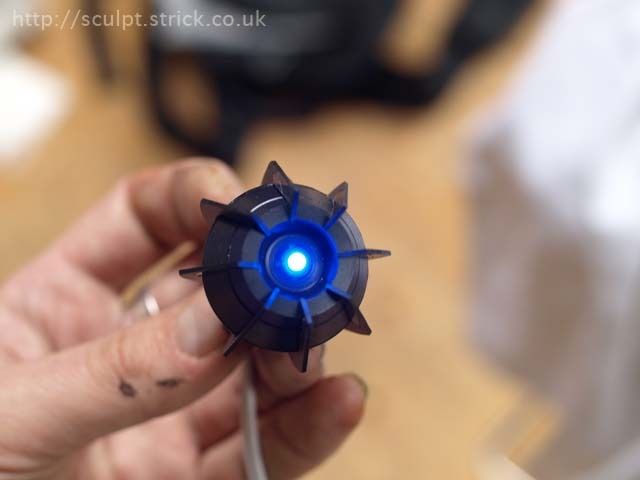 The eyestalk needed to be fairly lightweight as I didn't want it sagging or wobbling about. 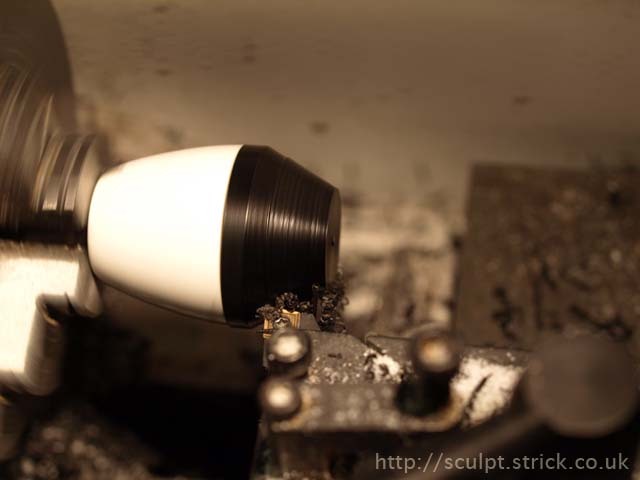 I knew the best way to produce the form was to turn it on the lathe, and Delrin (a machineable plastic) seemed like a good choice of material. Unfortunately, almost nothing will stick to Delrin (including glues, resin and paint) and I needed to be able to attach the 'fins' around the outside of the eye. I decided the best way round this was to turn the more critical front half and screw fit that to a back half to which I could glue the fins. I found a part from a lightfitting that was curved, hollow, threaded and around the correct diameter. I turned this down to produce a slightly elongated rear eyeball. 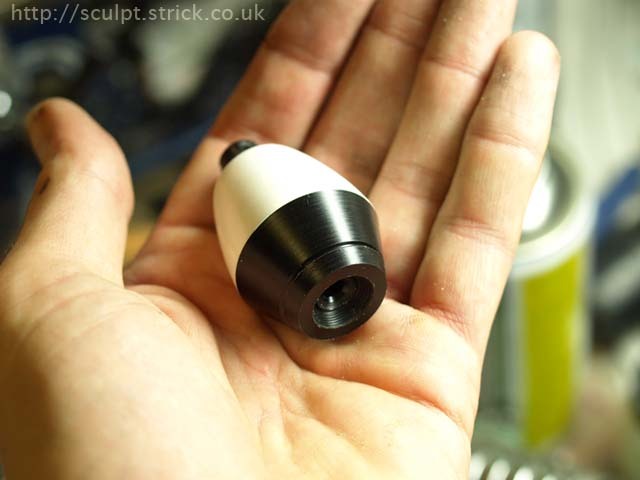 I then cut a corresponding thread on my Delrin, screwed it onto the rear half and turned the front part of the eye. 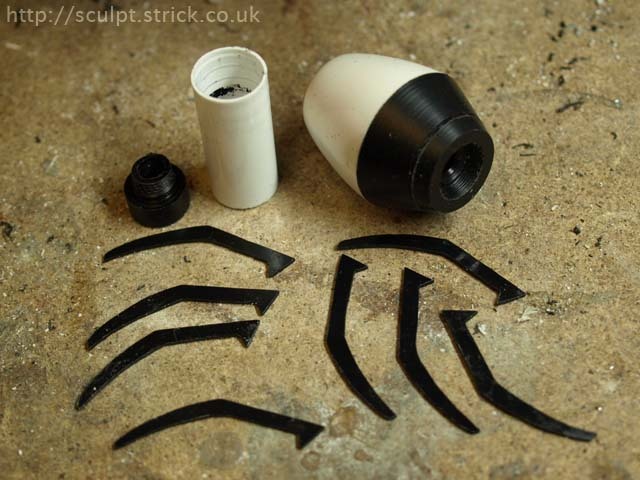 If more than just the two had been needed, I would probably have cast the eye in resin rather than machining extras. The fins were cut from styrene sheet and glued on at the rear. I turned a threaded connector to attach the rear of the eye to a short length of tubing. 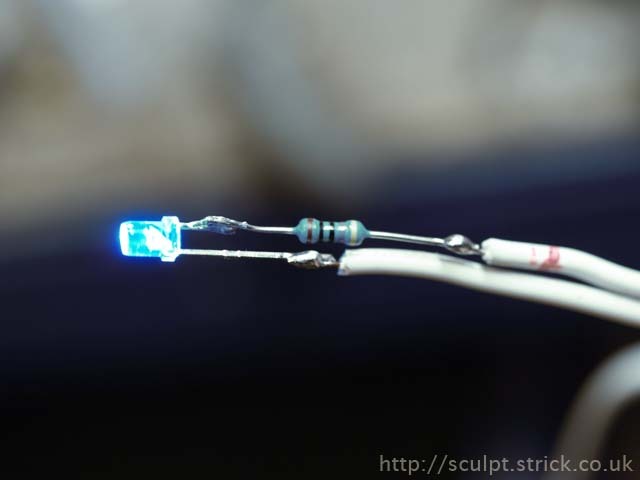 The lens on a high-brightness blue LED was filed down to create a more diffuse light and wired via the correct resistor, with the body of a cheap torch providing both battery holder and switch at the other end of the cable. The LED assembly passed right through the mask and the eyestalk and was fastened with a clip-on mounting bezel. The eyestalk friction fit into the mask reasonably securely, and the assembly could be dismantled if needed in case of electrical problems. In the episode, the corpses are wearing white parkas. I believe that the hoods were cleverly made oversized in order to disguise the oversized skull that results from its being outside instead of inside the owner's head. We didn't like the idea of either the expense or the heat of real parkas, and instead opted for customising over-sized boiler suits. My partner made larger-than-usual hoods from a cotton fabric that matched the boiler suits, lined them with faux-sheepskin and sewed them onto the collars of the suits. The 'Alaska' crew all sport white long-necked knitted sweaters. Again, to avoid the heat of wearing the real thing, as well as the expense, I asked my long-suffering partner to knit just the collars and a small patch of the front of the sweaters, since that was all that would be visible inside the suits. These were then stitched directly onto the necks of the masks. The finished costumes were well-received. I was pleased how many children recognised the subject matter (although it was lost on most adults) and the design is frightening enough even to those who don't know the TV show.